Abies hickelii was first described in 1932 by Fernande Flous (born 1908) and Henri Marcel Gaussen (1891 - 1981) of Harvard University Herbaria. 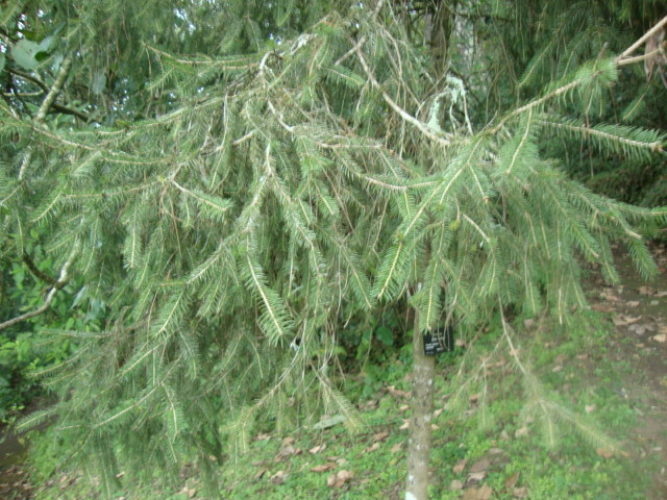 This species is commonly known as Hickel's fir, named in honor of French botanist R. Hickel. Other common names include oyamel or pinabete in the Spanish language. Abies hickelii var. 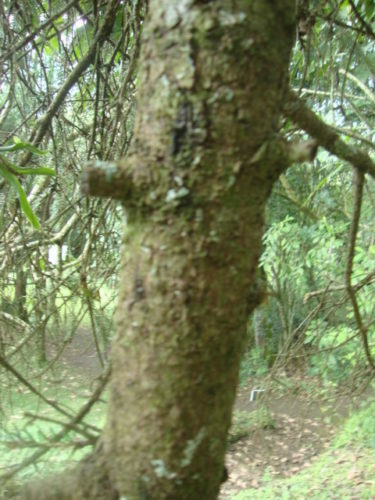 hickelii, the typical variety which is described here. Abies hickelii —original herbarium speciem. Description. 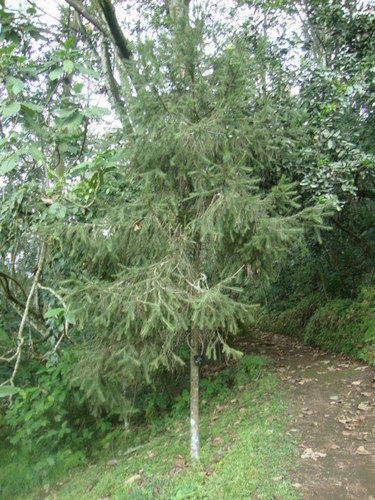 Hickel's fir is an evergreen coniferous species of tree which grows mature heights of 100 feet (30 m) tall with a 50 inch (130 cm) diameter trunk at breast height, usually seen with a single, straight, round trunk, often clear for a good part of the tree's height. The tree's crown is narrowly conical, less regular in old trees. Bark is initially smooth, gray in color, then thickening with age, breaking up into quadrangular plates. Branches spread horizontally, later ascending. Branchlets are slender, purple- or red-brown, grooved, glabrous or slightly pubescent, with small, ovate or round leaf scars. Leaves (needles) exposed to sun are angled forward; those in shade are spirally arranged but appearing 2-ranked, diverging at nearly right angles to the shoot, of about equal length; 0.7 to 1.4 inches (18 - 35 mm) long by 0.04 to 0.07 inch (1 - 1.8 mm) wide, twisted or curved at base, shiny light green above, glaucous below, with an emarginate (sometimes obtuse) apex. The needles present stomata in two bands separated by a midrib below, none or a few near apex above. Pollen cones are produced on lateral shoots. They are short, yellow with red microsporophylls. Seed cones are also produced on lateral shoots. They are erect, short pedunculate, oblong-cylindrical, with an obtuse apex, 2.4 to 3.2 inches (6 - 8 mm) long by 1 to 1.4 inches (2.5 - 3.5 cm) broad, initially purple, later ripening dark brown with a persistent, dark brown rachis. Seeds are circa 0.25 inch (6 - 7 mm) long, and light brown in color, with a light brown 0.4 by 0.3 inch (10 x 8 mm) wing. Distribution. This species is native to southern Mexico — the states of Guererro, Oaxaca, and Chiapas growing at elevations of 8,000 to 9,600 feet (2,500 - 3,000 m) above sea level, where the climate is cool, oceanic, and winter-wet. It naturally grows in volcanic soils. It is occasionally found in pure stands (at the highest elevations), but mostly in mixed stands. Ethnobotany. In habitat, this rare species is seldom and then incidentally harvested for timber. It is rare in cultivation, largely limited to botanical gardens in areas with a warm-temperate climate. Attribution from: Farjon, Aljos. ©2010. A Handbook of the World's Conifers. Leiden, Netherlands: Brill Academic Publishers. Abies hickelii — a young specimen in habitat. Abies hickelii — a closeup of bark detail. Abies hickelii — a closeup of foliage detail.